The convertible started making some funny noises, so I had to go see Bob over at B & W Automotive in Marlborough. 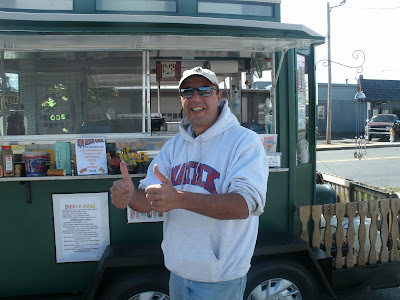 He’s been my mechanic for a few years and he used to work on my Hot Dog Truck. 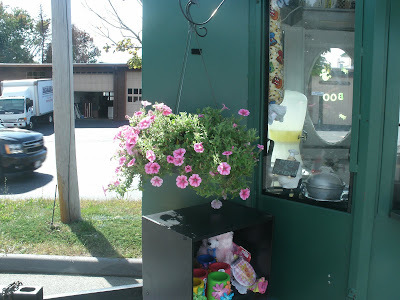 In order to get to Bob’s shop, I have to drive right by my old location at 420 Maple Street in Marlborough; right in front of Gold’s Gym (I always thought it was ironic having a hot dog joint in front of a gym). I spied this sign as I was coming up the street…. 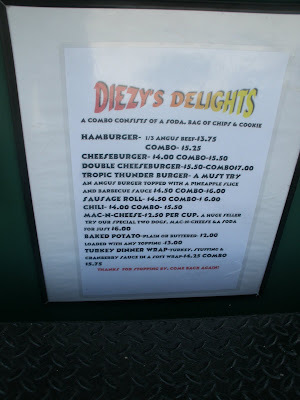 It turns out Diezy’s is a Food Trolley! Diezy’s Dogs is owned by the lovely and talented Diane Duprey. Diezy is no stranger to the hot dog business: she and her ex husband used to own The Trolley Stop on Speen Street in Framingham and another smaller trolley style hot dog stand that was parked at Building 19 in Natick. 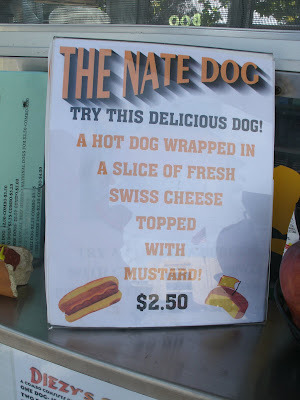 They sold all that off when they split up, but Diane had been bitten by the hot dog bug- she wanted to find another rig. She did, and it’s a classic gem. 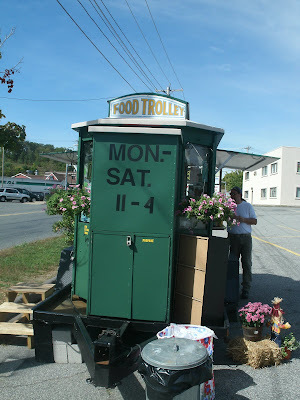 She’s only been open for a few weeks, but Diane’s in it for the long haul: she plans on staying open through the winter!. 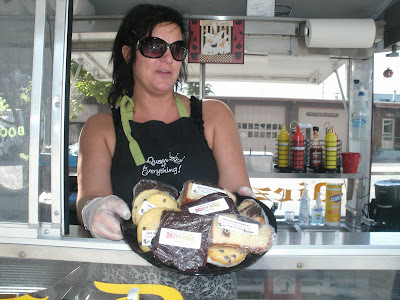 I spent quite a bit of time chatting with Diane and I amazed her when I remembered what some of her customers had on their dogs (hey they were my customers once). She even said a lot of customers were asking for me- I was touched and got a little verclempt. 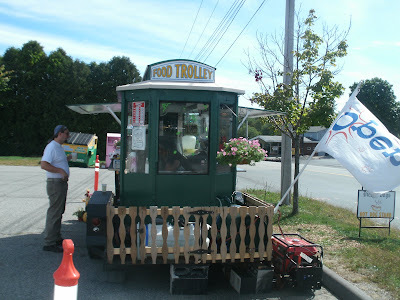 Diane told me these trolley style food trailers were manufactured in Everett, Massachusetts back in the 1960’s and there are very few left in existence. It’s a true retro hot dog trailer and it’s a darn good looking rig. This particular unit was in service in Framingham for twenty years. It was owned by a “really nice English lady” who sold coffee and doughnuts out of it at one of the Framingham train stations. When Diane first looked at it, the trailer was in pretty rough shape. There was a lot of corrosion and rust, even a hole in the floor! 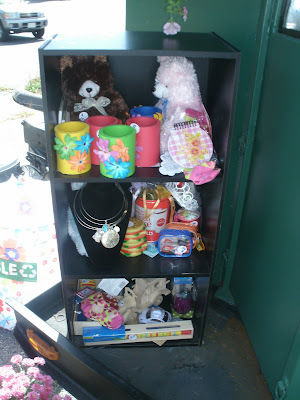 The entire interior was trashed too- it needed a complete overhaul. Lucky for Diane, her brother, Greg Moffit, owns GMS Automotive in Worcester and has all the welding and auto body repair tools they needed to get the little food trolley looking brand new again. Greg’s got a vested interest here, he owns the trailer with Diane. 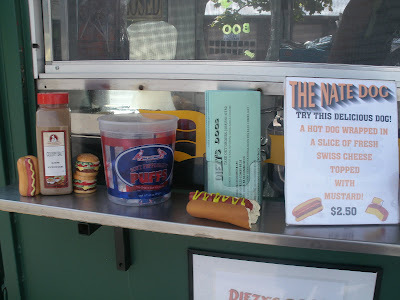 Basically, Diane has the hot dog trailer equivalent of a completely restored classic car. The little “deck” you see here holds the fresh and waste water tanks. 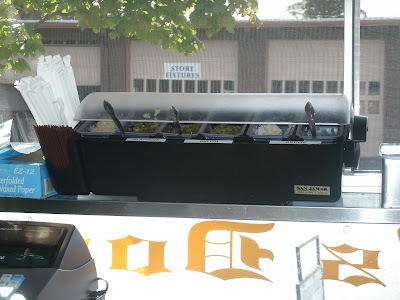 The inside of the trailer was redone to include four new sinks, a two bay steam table, full size refrigerator with freezer space, storage areas, prep areas, and a small grill and broiler. It’s a totally mobile mini kitchen. A brand new generator and propane provide the power. 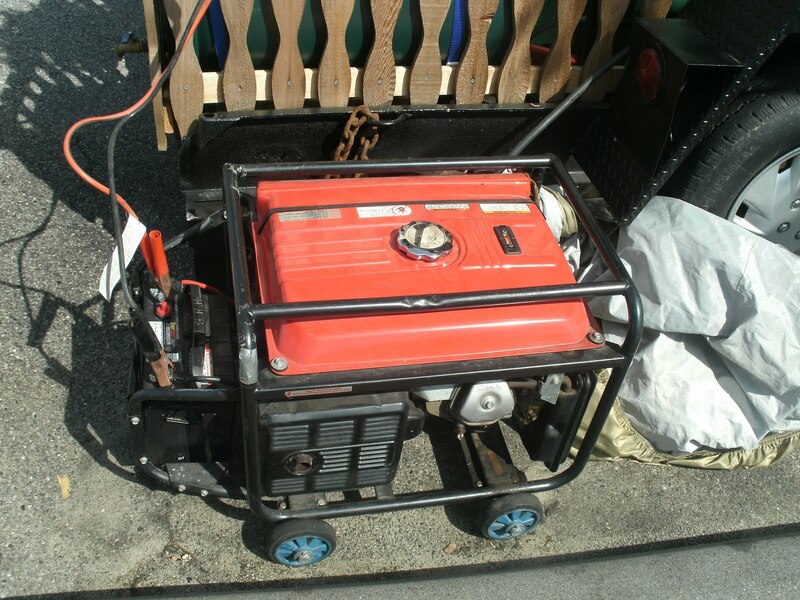 Greg had a solar battery charger hooked up to the trailer today- Diane is exploring using solar power to run at least a portion of her electrical equipment. Diezy’s has the “woman’s touch.” She sells craft items and has a basket of toys for the kiddies who stop by. There’s even some hanging flowers. 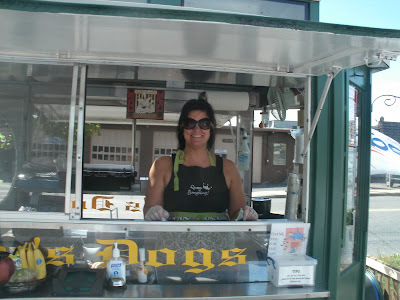 The only “flowers” I ever had at my hot dog truck were the weeds growing through the cracks in the parking lot! I had a great time chatting with Diane and, while she was taking care of other customers, I checked out the menu. There’s a full complement of hot dog choices including chili dogs with her own home made chili. 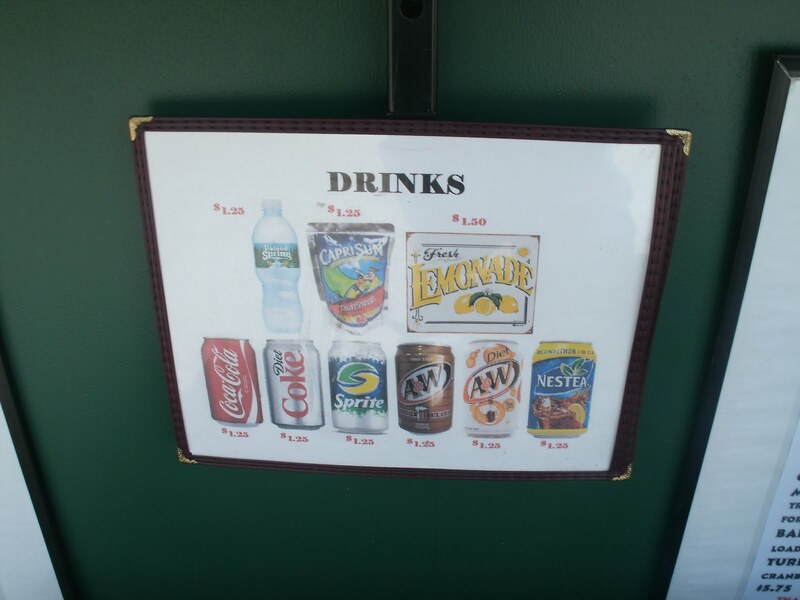 A nice variety of beverage choices is available, including home made lemonade! It’s a full on epicurean experience. 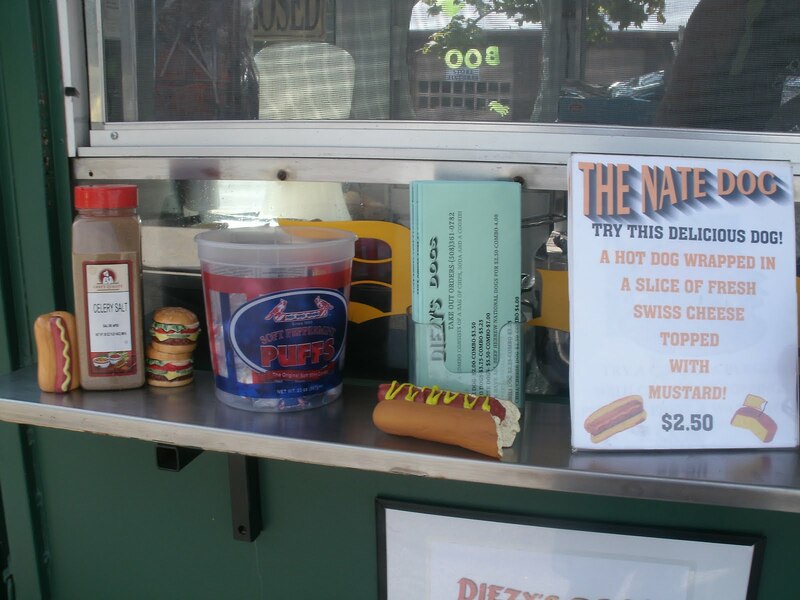 I have never seen baked potatoes at a hot dog stand! 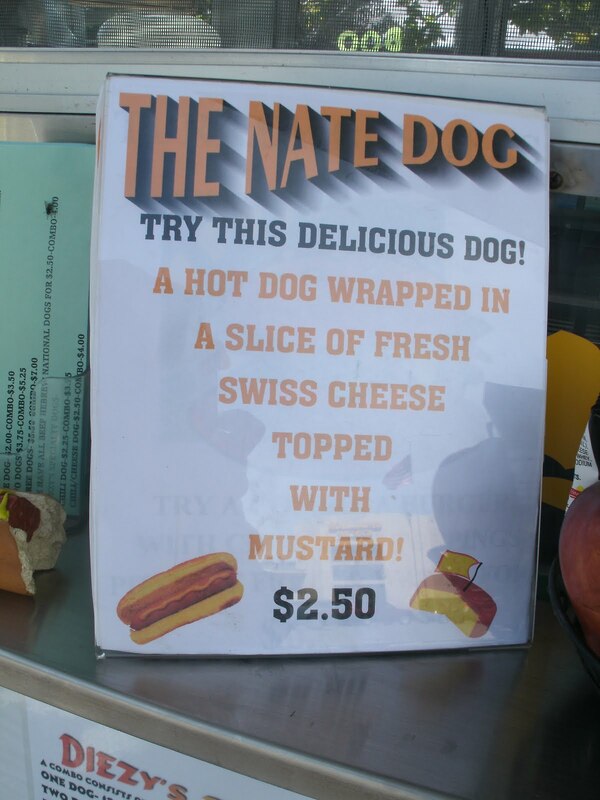 One of her best sellers is “The Nate Dog,” named after her son who “invented” it. Sounds good, eh? Diane dresses the dogs herself. 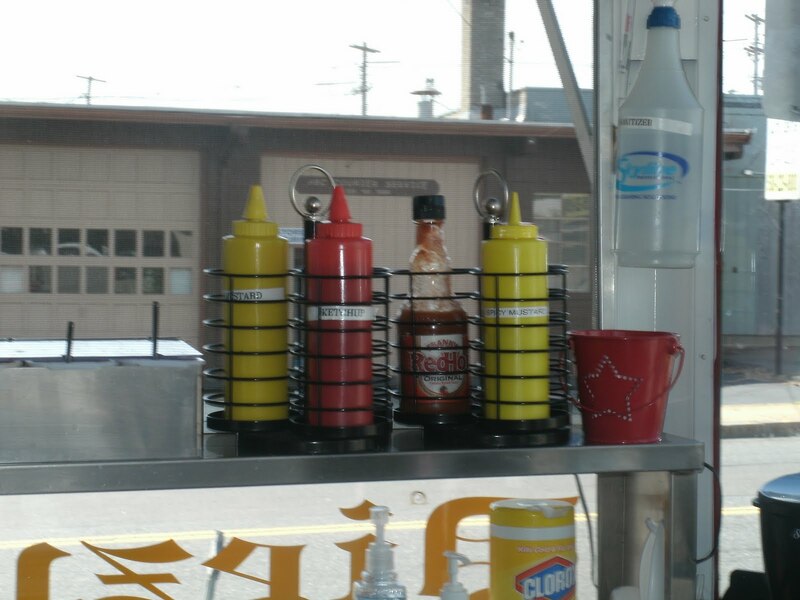 She has Red Hot Sauce, brown and yellow mustard, and ketchup. She also can provide the aforementioned chili, Russian Dressing, pickles, onions, relish, jalapeno peppers, marinara sauce, horse radish sauce, cheese, bacon bits and coleslaw. The only self serve condiment is the celery salt (and the free mints). 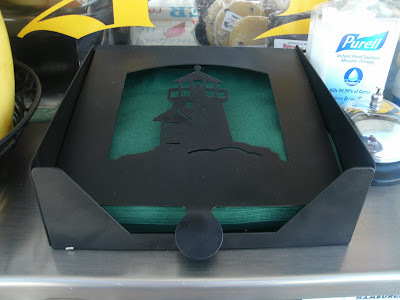 Even the napkin dispenser is shnazzy: much better than the rock I used to put on my stack of napkins! 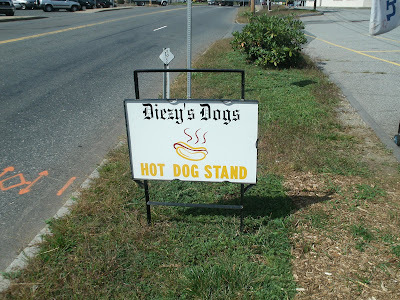 Diezy’s serves up a Kayem Old Time Frank from the steamer on a grilled split top, New England style hot dog roll. She also has Hebrew National Franks upon request. 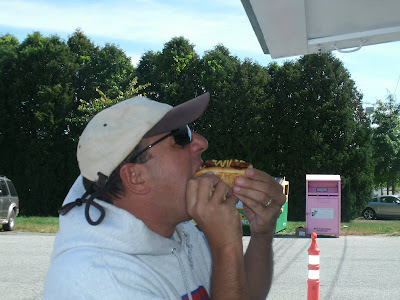 I went for a bacon dog with brown mustard and a slaw dog topped with, you guessed it, BACON. Everything tastes better with bacon! I chose the home made lemonade for a beverage. Look at those yummy looking dogs. I can’t wait to…. 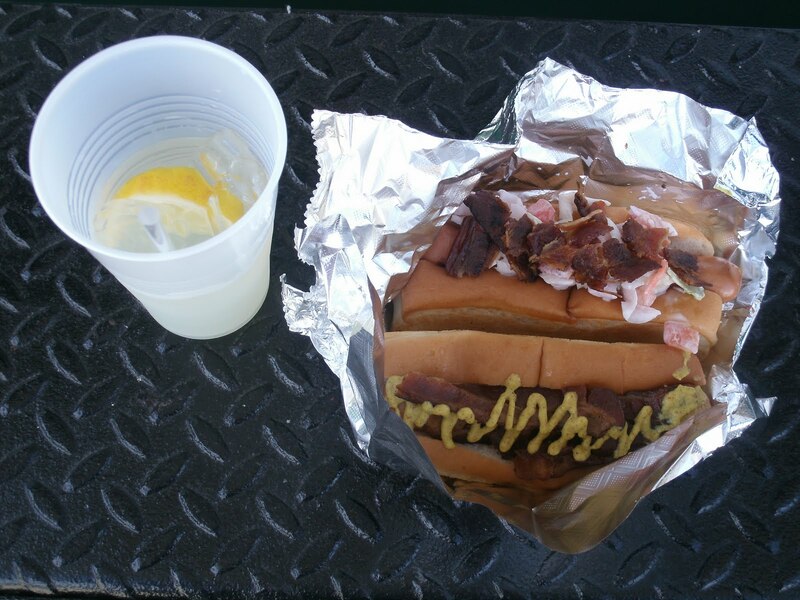 These were two very yummy hot dogs. The coleslaw is Diane’s own, home made “Summer Slaw.” It’s lighter on the mayo than regular slaw and it has tomatoes in it. The crunchy bacon, snappy hot dog, and grilled bun provided nice, contrasting textures while the flavor of the dogs, bacon, and condiments danced around on my taste buds. EXCELLENT! 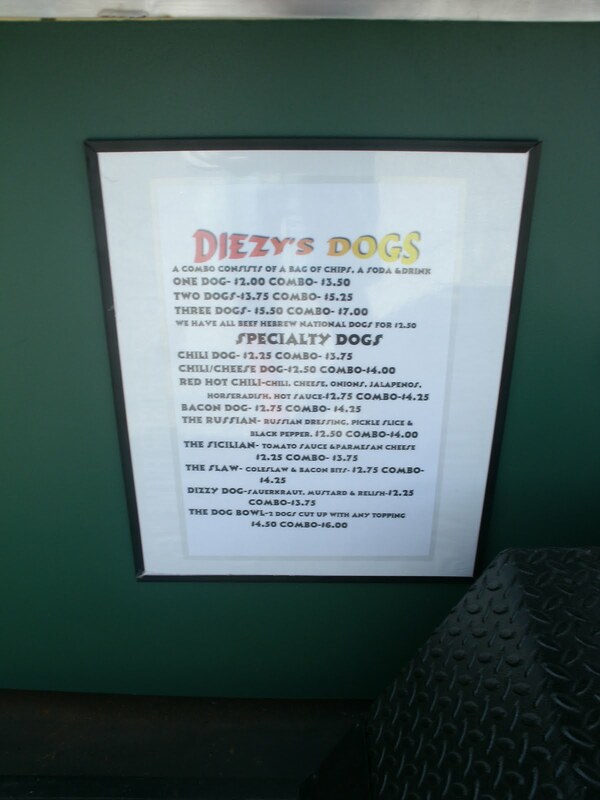 I’d have both again, but I’m gonna try the chili dog next time. The lemonade was tart and tangy with just a hint of sweetness-the way home made lemonade should be. When I was done, Diane offered up some of her home made desserts. 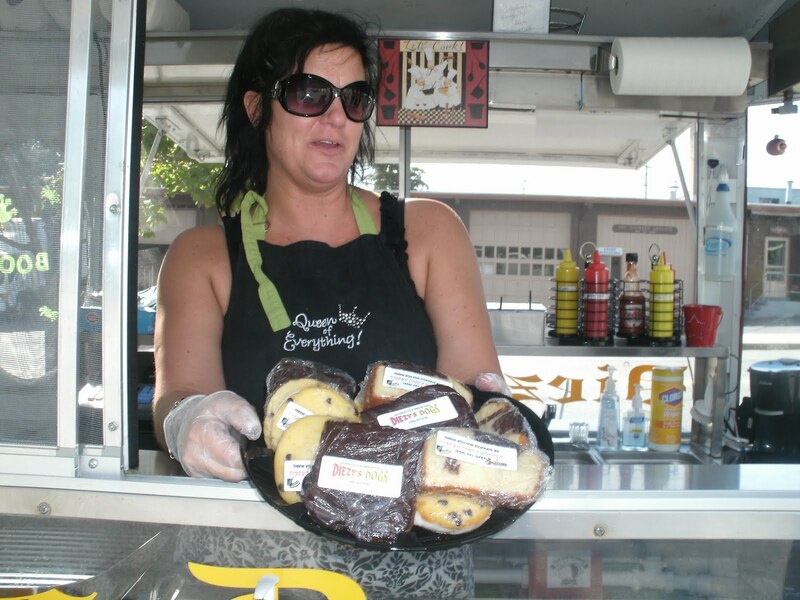 She’s got cookies, brownies, pound cake, and whoopie pies. Yummy stuff. 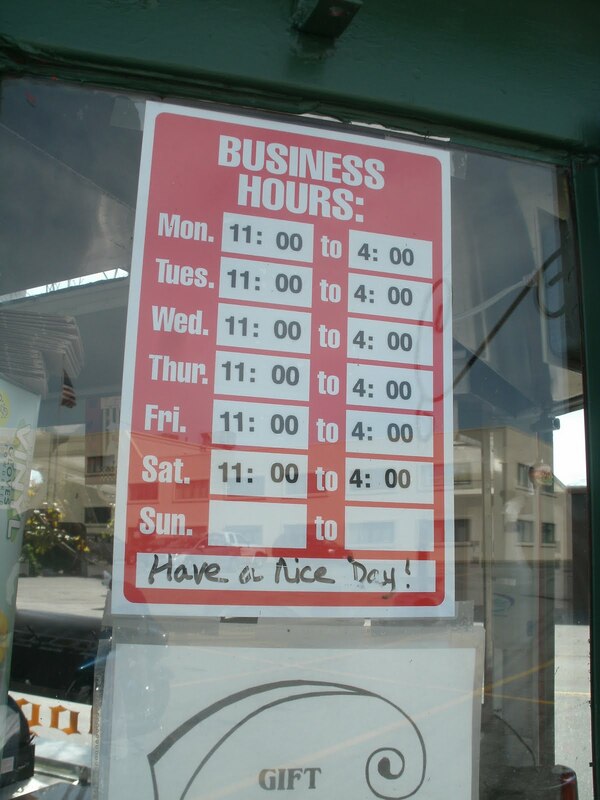 As I said earlier, Diane is going to stay out during the winter, so she’ll be open Monday through Saturday from 11 AM to 4 PM. 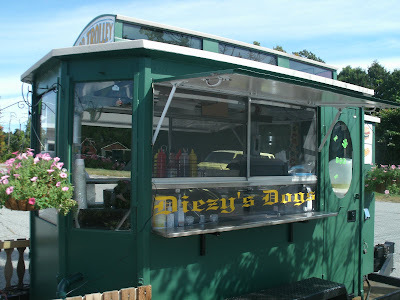 Having an enclosed trailer (or truck) keeps hot dog men and women out of the elements and in the black in Massachusetts. I implored her to make some sort of website or even a Facebook page for her business so she can keep the world posted on her availability. She plans on doing other gigs and events too. If I’ve said it once, I’ve said it a thousand times: bringing your hot dog cart, truck or trailer to special events is a BIG MONEY MAKER! She recently attended the Metrowest Humane Society‘s Annual Craft Fair and made a tidy sum. The Humane Society folks liked her so much they recruited her to help out over there! Being a self confessed sucker for a good cause, she’s assisting with their cat adoption program now (when she’s not serving up hot dogs). Between her great personality, decorative flair, and great food, I’d say Diane is off to a good start in her new hot dog business. Diezy’s Dogs gets TWO BIG THUMBS UP from the Hotdogman! When in Marlborough, stop by Diezy’s Dogs and sample some of Diane’s home made goodness.